BABCOCK RANCH MASTER DRI NOTICE OF PROPOSED CHANGE (NOPC)REVIEW OF THE CHARLOTTE COUNTY DEVELOPMENT ORDER AMENDMENTCouncil Recommendations (Attachment I)On October 20, 2011, the Southwest Florida Regional Planning Council (SWFRPC)recommended approval of the Babcock Ranch Master Development Order Notice of ProposedChange. The change is to revise the office entitlement from 2,064,175 to 3,500,000 square feetand retail entitlement from 2,925,943 to 1,400,000 square feet and to revise Exhibit "F" to reflectthe results of the required Master Traffic Study Update. Also, proposed is an extension to thebuildout date from December 31, 2030 to July 5, 2040.  This includes a 4 year 364 day extensiongranted by Chapter 380.06(19)(c)1.F.S., a 4 year extension granted to DRIs by HB 7207, and a187 day appeal tolling period from the time the original MDO was adopted on December 13,2007 to June 17, 2008. 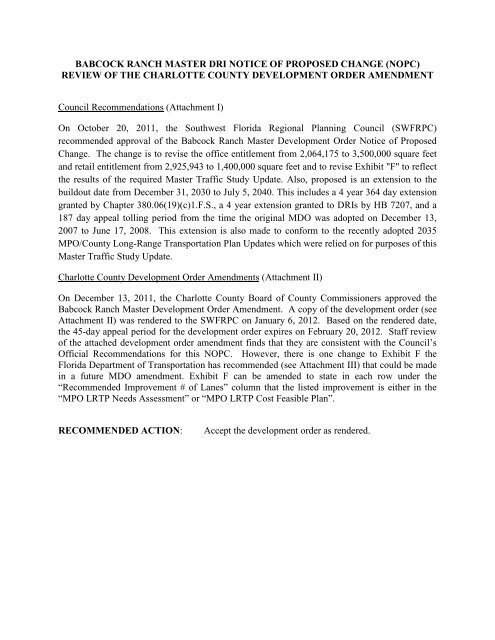 This extension is also made to conform to the recently adopted 2035MPO/County Long-Range Transportation Plan Updates which were relied on for purposes of thisMaster Traffic Study Update.Charlotte County Development Order Amendments (Attachment II)On December 13, 2011, the Charlotte County Board of County Commissioners approved theBabcock Ranch Master Development Order Amendment. A copy of the development order (seeAttachment II) was rendered to the SWFRPC on January 6, 2012. Based on the rendered date,the 45-day appeal period for the development order expires on February 20, 2012. Staff reviewof the attached development order amendment finds that they are consistent with the Council’sOfficial Recommendations for this NOPC. However, there is one change to Exhibit F theFlorida Department of Transportation has recommended (see Attachment III) that could be madein a future MDO amendment. Exhibit F can be amended to state in each row under the“Recommended Improvement # of Lanes” column that the listed improvement is either in the“MPO LRTP Needs Assessment” or “MPO LRTP Cost Feasible Plan”.RECOMMENDED ACTION:Accept the development order as rendered.